Sendrecurring’s Soft Launch, Now Happening! We’ve got two big announcements today! First, we’ve added recurring text messages to our list of awesome features (more on that later), and second, we have now entered the “soft launch” phase of our upgrade! You got it, guys. So we fixed the bugs and added the features they talked about, and decided to come up with a few different packages to fit the users’ needs. Well, here’s the great thing: It’s not going to ruin anything for anyone! As always, Sendrecurring is free to use for anyone. We’ve created some paid package options, which means we’ve put a limit on how many emails can be sent per month. Keep reading for our pricing information – it’s reasonable, we promise. Since we’re fine-tuning some of Sendrecurring’s features and we want to give our users a decent amount of notice, we’ll be making the switch to the limited Free Package on December 1, 2013. No fees, no limits until then. Account creation will be required for all users. This doesn’t mean everyone will have to start paying, it just means that everyone will need to create an account (free for everyone). Annoying, you say? We think spam is even more annoying, so by creating annoying accounts, we’re preventing even more annoying spammers from botting around and ruining people’s days. Once you create your account, you’ll have free access to all of Sendrecurring’s Free Package features. Your account will only be upgraded if you say so. We know that it can be tough to get used to changes, especially when you’ve been using the service for a while. The official launch of the paid packages will be in December, but we are now offering the paid service as an option before we start enforcing the limits. If you know you’d like to use the service through one of the paid packages, now’s the time to buy. Here’s why. Upgraded accounts will have access to our newest feature, recurring texts! The free accounts do not (and will not) have any texting ability. Also if you sign up now, your transition on December 1 will be seamless (especially if you’re currently using over 100 emails). We really hope you are as excited as we are about the new features! Go check them out and let us know what you think! Suggestions and feedback are the reasons we made these updates in the first place, so you should know that what you have to say really does matter! Hop to! Set up your account if you haven’t already, and start exploring the new features! Then, while browsing Pat Flynn’s site Smart Passive Income during naptime (Have you seen this site? Chock full of business building advice and other online marketing tips! ), I came across this article on increasing your email open rate, and thought it had some great advice for all of Sendrecurring’s users! 2. Re-send your email to those who didn’t open it. Sometimes emails get all tangled in the web (see what I did there?) and either never make it to the inbox or get overlooked due to bad timing or whatever. Send it again! There’s more great stuff in the article and comments, but I don’t want to spoil the fun, so you can check it out by clicking here (SFW). So we’re adding a resend button to our long list of features to add to SR, and we hope you’ll continue to send us marriage proposals, er, I mean feedback emails. Send Reminders Quarterly, Bi-Yearly, Yearly or… whatever! This morning I put the final touches on the latest feature for Sendrecurring: a longer than monthly option! Users can now schedule reminders to send any X number of months. However long you want! This is a great feature that a lot of users have suggested. I really wish I could have implemented it sooner but it is a more difficult thing to code than you would initially think, due to every month having a different number of days and leap years, and that Python does not have an “Increment by Month” function in their datetime library. For those that are curious I will brain dump a little on how I implemented it. The original system for monthly reminders was pretty simple and foolproof, I would simply add days to the current date until I was at the date that a reminder should be scheduled. This handled both cases of initial creation of a reminder and rescheduling a current reminder really well. In the new system I could not do that. Reasons include that a new email will need to be sent this month, not X number of months away, and that a reminder past its send date due for rescheduling should be rescheduled X number of months away. 1. I check if the current time is after the reminder/emails scheduled time (ie already past). If it is then I automatically start looking at future dates for it to be scheduled. 2. I check if the date of the reminder’s LAST scheduled send is before todays date. Brand new reminders will not have this, so that is an indicator that one is brand new. If today’s date is after the last scheduled send then that means it has been scheduled before and any subsequent schedulings will use the X number of months information. A snippet of source code below (this is rough and untailored for the blog) but could make some sense if you really need to a solve similar problem. Just ask me if you want clarification :D.
A few of you may notice that I use monthpattern * 30 for the “month” increment. This is actually slightly lower than the real days per month average of 30.4. The downside to this is that if someone does a really long monthlypattern, the days could eventually be off. It would need to be off by an entire month for the subsequent datetime.timedelta(days = 1) to no longer “catch” the desired date so there is some buffer for error. I will be keeping a watchful eye on what happens with this. Anything over 75 months may be inaccurate, 6.25 years. I wonder if anyone would really want to be reminded about something that far off. 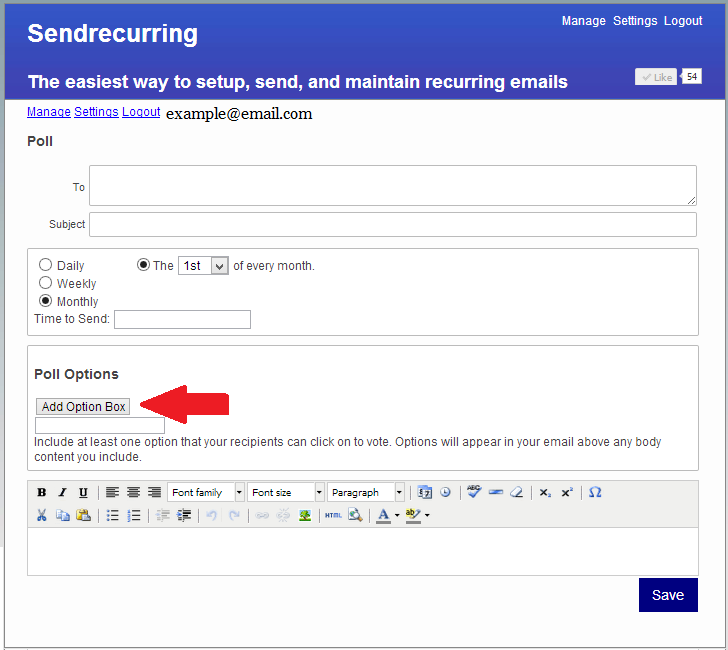 How to Send a Recurring Poll – New Feature! Hi everyone! 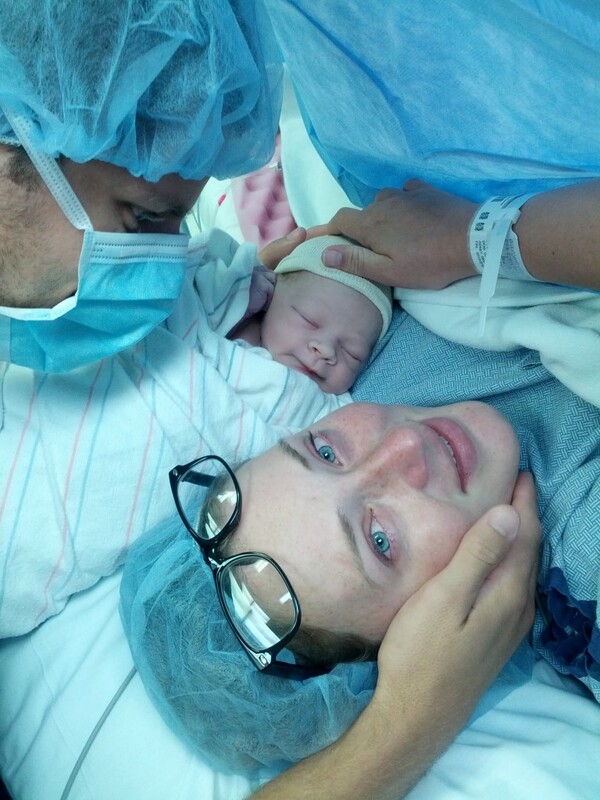 This week, we’re eagerly awaiting the birth of the Sendrecurring Family baby, who is officially overdue. 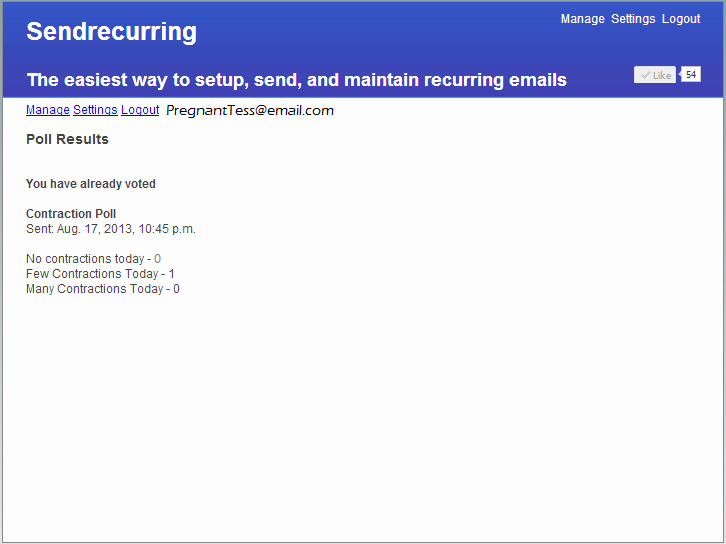 I thought I’d throw together a little tutorial on using Sendrecurring’s newest feature, polls. They’re easy to create, send, and view results for! It will take you to a screen that looks very similar to the “New Email” page. From here, fill out your email as you normally would, making sure to include To, Subject, and send info. In the box below “Add Option Box,” enter a poll question or option. 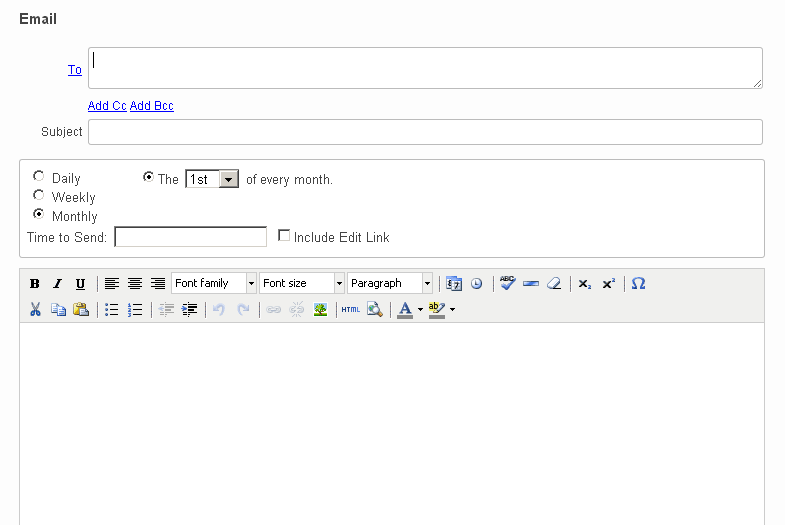 To add additional options, click on “Add Option Box.” Empty boxes will appear where you can add your additional options. Since we’re waiting for our baby, Conrad put together a poll for me to answer each day. Here’s a peek at what your poll will look like to your recipients. 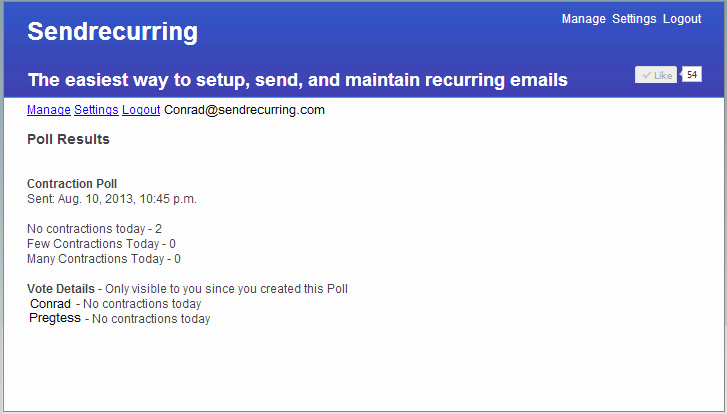 This email contains three poll options and some additional email text (Conrad specified to “Click one of the options to vote.” Ignore his typo). You can add text in the composition box if you need to send your poll with any instructions or descriptions, or just to send a regular message. The text you add in the email box will appear after the poll links, as shown above. Once you send your poll email to your recipients, the poll options will show up as clickable links. The recipients will be able to click on their answer, and the data will be recorded. It is currently only an option for recipients to vote once. This new tab will display the current poll results (anonymously), as well as a “Thank you for voting” message or a “You have already voted” message. As the owner of the poll, you are able to view more results. In your account, below your list of emails, you can view your polls and their data. Click on “View Details” to expand the box, and you can see the amount of recipients, opens, and votes per sent poll. If you still have any questions, leave a comment or send an email to conrad@sendrecurring.com. 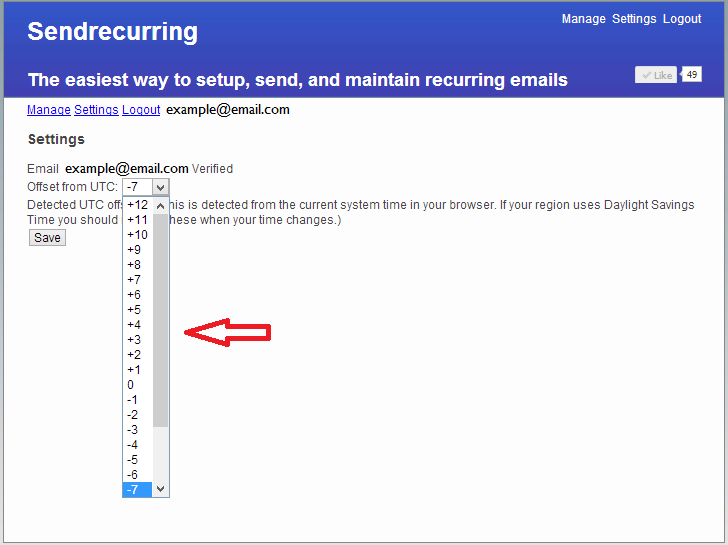 We recently added Time Zone Detection to our email service (! ), and it automatically detects which time zone you’re sending your email from based on your browser’s time on your computer. But sometimes, that time isn’t correct, or isn’t the time zone you want your email sent to/from (like if you’re travelling or daylight savings hits). So we made it so that you can change the time zone if you want. Click on the dropdown menu and select your desired time zone. OK, so maybe we don’t all have our time zones and correlating positive or negative numbers memorized. So here’s a little guide to time zones and their numbers. 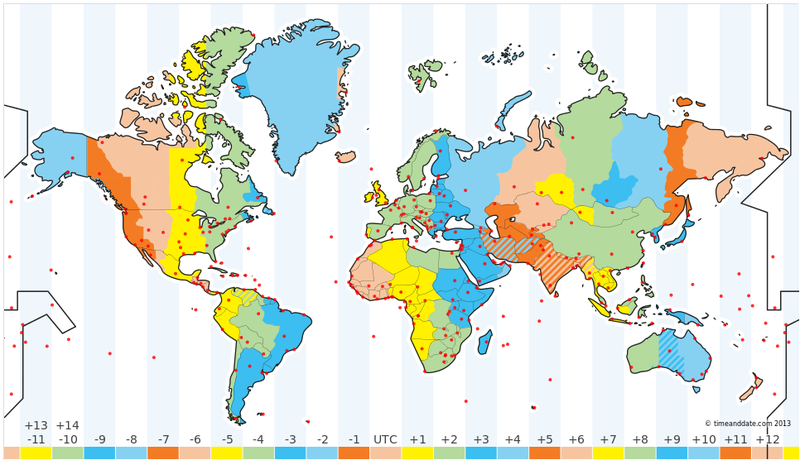 We found this awesome image here if you want to read up on time zones. It’s an exciting subject. Hopefully this makes it easier for you to change time zones for your emails if needed! 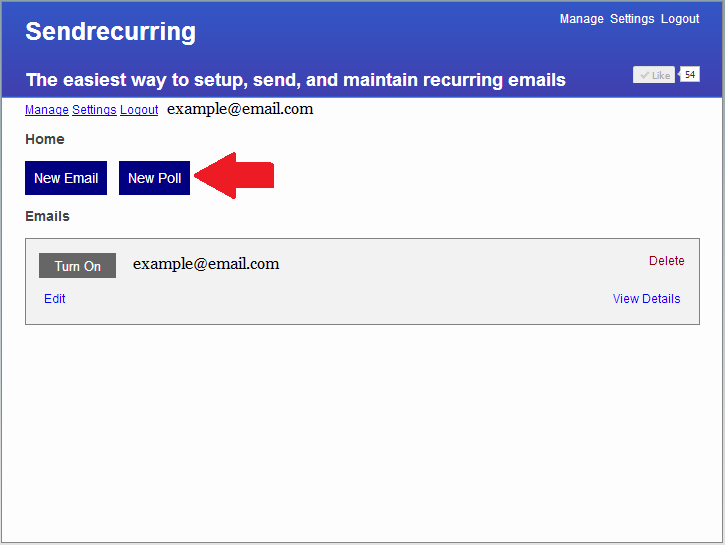 Improvements to Sendrecurring, part 2! Hey everyone, Tess here, Conrad’s super-awesome, super-pregnant wife. I’m going to be contributing some content to the website and blog so I wanted to introduce myself and say hello! I hope you all think Sendrecurring is as awesome as I do. Conrad recently posted about some of Sendrecurring’s new and upcoming improvements, and I wanted to just throw a cherry on top of that sundae and tell you a little more about the amazing things we’re working on to improve the user’s experience. Conrad mentioned in his last post that he updated the time entry box so that you can send an email at any time of the day, rather than just on the hour. He also added a Time Zone Detection feature that lets you alter the time zone you send your email in. To view or edit your Time Zone, go to your account management page, click on Settings, and edit your UTC in the drop-down menu. More info coming on this feature soon. UPDATE: Here’s a helpful post on how to adjust your time zone and a guide to time zone numbers. 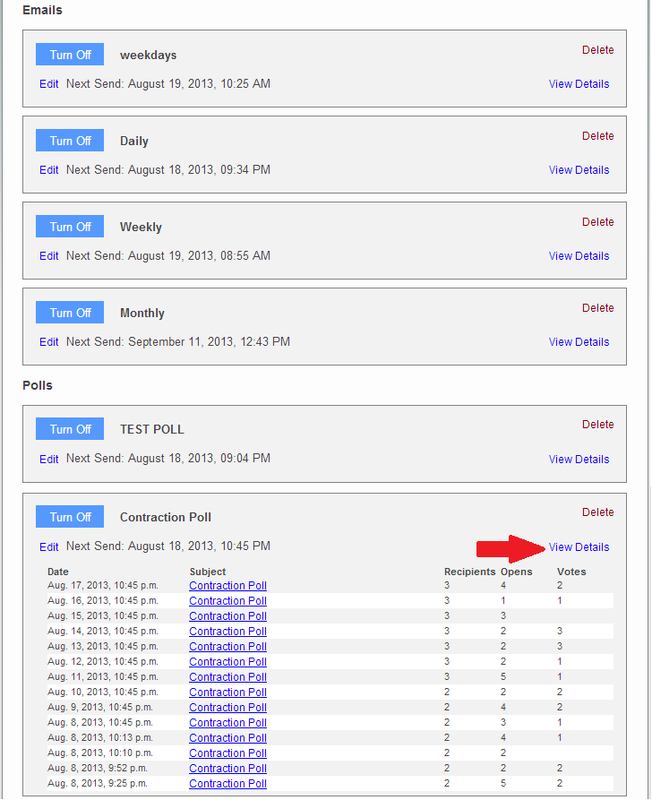 You’ll soon be able to send polls and surveys with your emails, and you can review the results in your email stats. One of our fears with creating paid account options was that some of our users would stop using Sendrecurring because they didn’t want to pay, so we made sure to keep a free option with slightly more limited features. Don’t worry – we won’t be making the switch right away, so continue using Sendrecurring! We’ll provide LOTS more information about the paid account options before we add them. We want to put together a page specifically for testimonials from happy users of Sendrecurring so that investigators can see what an awesome service it is! We can’t put this together without your help, though. If you’d like to submit a story or testimonial of how Sendrecurring has helped you, either personally or professionally, we’d love to share your story! I’ve updated the FAQ page so its answers are more current and relevant to the new features. If you have any questions about how Sendrecurring works, don’t hesitate to send your questions to us! Sendrecurring.com is getting some upgrades! You may have noticed some minor upgrades over the past weeks such as corrections to wording and description, and better validation on lists of comma separated emails, but BIG changes are on the way. Sendrecurring is getting user accounts! User accounts will begin being rolled out soon. If you read this and would like an account now head on over to the signup page and then proceed to the login page. You will be confronted with a single confirmation email (likely your last one if you make an account) before you can being using it. What will you find after logging in? A MUCH nicer dashboard for handling all of your emails! No “Owner” email. You are already logged in you don’t need to enter this! No Start Date and End Date or Duration boxes. What? How? 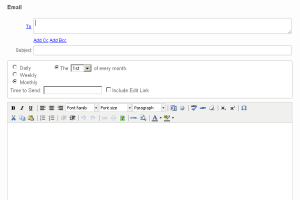 Email starting and stopping will be controlled by the Turn Off and Turn On buttons on the manage page, overall much easier to understand and use than all the date selection boxes! New emails will start out Turned On and you can toggle them to your heart’s content from there. A much improved time entry box. There’s still a drop down for time selection if you want it, but the new box also allows you to type out times such as: “3:30 am” “15:00” “12 45” and auto-completes a correct time from there. No limit on specific times. Previously the time dropdown was limited to send only in hourly increments. Well that is gone now. 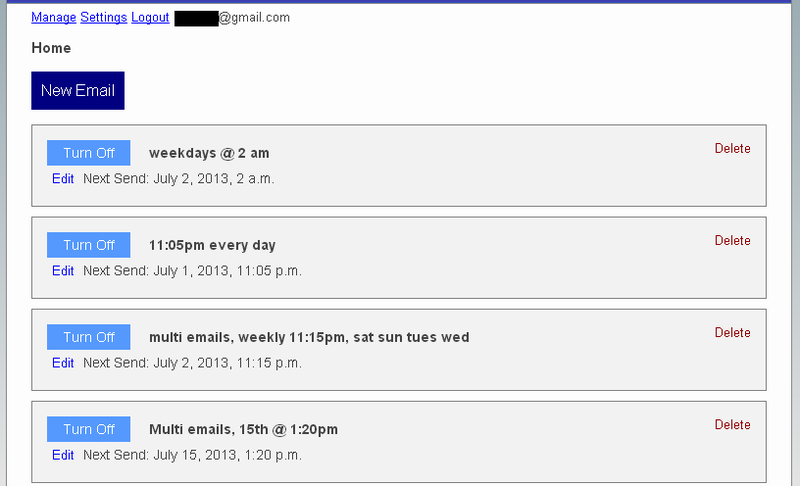 The new type-in time box, coupled with the server improvements allow emails to be sent at any time you want, 5:31 am? Sure. 6:47? Whatever. I expect the majority of emails will still be sent at even or quarterly times, but the option for any time was often requested, so here it is! These new features will not be replacing the current features… right away. I do plan to phase out the non logged-in email creation with support for updating the emails you do have continuing on for quite some time. Expect the landing page to have some information about logging in and the new account in the near future. Also, all this great stuff is still going to be offered for free! Tell your friends and coworkers! There was a 12-hour outage to the mail system of the site today. The issue was due to Sendrecurring switching to the high replication datastore recently. The Appengine service gave Sendrecurring the “default” limit of 100 emails per/day after the switch, to be upped back to the regular limit after the first billing cycle (one week). Well, Sendrecurring hit that 100 limit very quickly before users started noticed the problem. The limit is back up to the normal one now. Sorry for the gap in service. Sendrecurring is moving forward after many months on the back-burner! I am excited to be working on it again. To kick things off I did some changes behind the scenes, sorry, not much to see from outside appearances. I won’t keep it a secret that I am using Google App Engine as the backend for Sendrecurring. A year ago they offered a new feature called the High Replication Datastore, which is a fancy term describing how an app is spread across Google’s servers, which I had not taken the opportunity to upgrade to. I did that this evening! Hooray for security, server safety, and data redundancy! Secondly, I cleaned up all of the html template files for that front-end of Sendrecurring. I don’t know what I was thinking 1.5 years ago when I hacked them all together, but they were a disorganized mess. Things are more orderly now, and some sense has been established. Why am I doing these changes to the backend? Well I am preparing for some big changes to the overall application and would like clean plumbing before diving in too deep. Changes forthcoming, possible features are….. logins, saved contacts, open-rates on emails, attachments and definitely more fine-tuned recurrence options and delivery. An unreliable bug in the timezone code was causing emails to be sent at incorrect times. It got complicated but the gist of it is that the timezone offset for an email was adding or subtracting incorrectly to the actual send time, and other logic was causing the email to still send in the correct 12-hour block, so emails were being sent out correctly OR up to 6 hours off of when they should be. Very unreliable, I believe it has been fixed and have tested with emails of my own. I also fixed a bug in the Email Retrieval tool on the site. In some cases it was retrieving emails that had been cancelled or otherwise expired and these emails just led to an error page. No good! 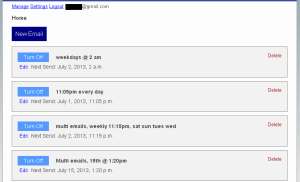 The Retrieval Tool now correctly only sends you emails that are active. Please let me know if you find anything that is acting up.